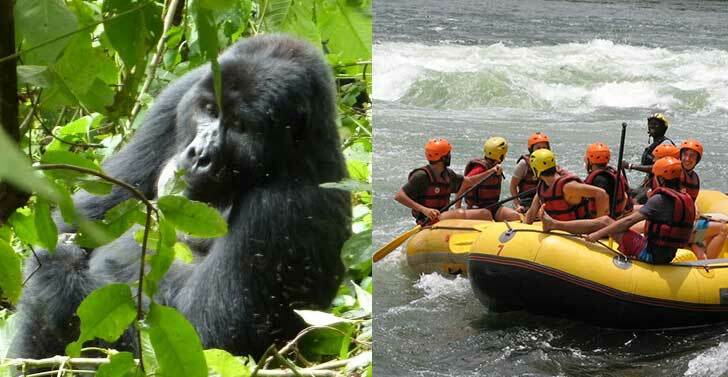 This fantastic Uganda Tour to Kibale Forest, Bigodi swamps, Queen Elizabeth, Ishasha sector and Bwindi National Parks for game viewing, chimpanzee tracking, cultural trips, gorilla trekking, boat cruise, tree climbing and bird watching. Take a city tour in Kampala, visit Kasubi tombs, bahai temple, Uganda Museum, Art and crafts shots and local markets, and later transfer to the airport for your departure flight. Note: If you’re not interested in rafting, there are plenty of other fun-filled activities you can enjoy while on tour in Jinja and these include Bungee Jumping, River Kayaking, Quad biking, horseback riding, Jet boating among others. Just let us know which activity you want and we will add it to the itinerary.